HORAN Capital Advisors Blog: Is This The Much Awaited Market Pullback? Is This The Much Awaited Market Pullback? Today the S&P 500 Index fell 2% and this takes the Index into negative territory for the month of July: -1.51% on a price only basis. For the year the S&P 500 Index remains in positive territory, up 4.44% on a price only basis. The question for investors is whether this weak July and significant decline on the last day of July is a precursor to further market weakness. Answering the question may be important as a number of investors are waiting to "buy on the dip." Is July, and more importantly, the pullback today "that" dip or is more downside weakness ahead. Quite a bit of technical damage was inflicted on the market today with the 2% pullback. However, the extent of the pullback, I know only 2%, does put the market close to some technical support. 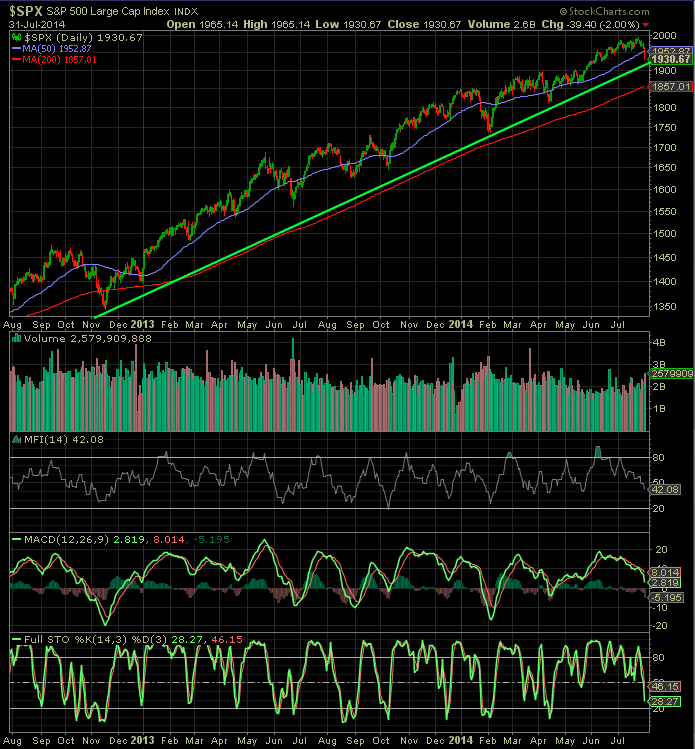 As the below chart shows, the S&P 500 Index is approaching the green support trend line. The support level is about 1,907 or just a little more than 1% below today's close. Other technical measures have support near this level as well. One technician I follow is Charles Kirk of The Kirk Report. Traders and program trading implement strategies based on these so-called technical setups. 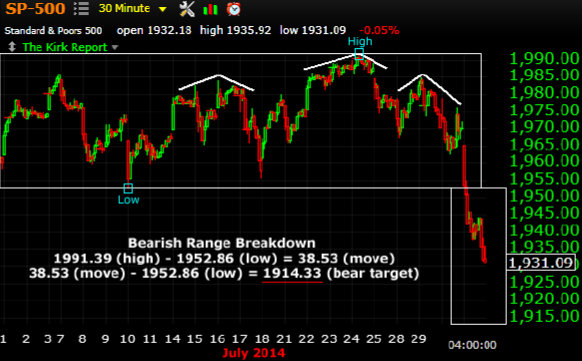 As Charles Kirk noted in his after market report tonight, today's action triggered a bearish head and shoulder pattern. The measured move downside target of 1,914 and is near the trend line support level noted in the above chart. With the end of July now in the books, commentators have turned to the outlook for August. A couple of charts making the rounds over the last few days are noted below. 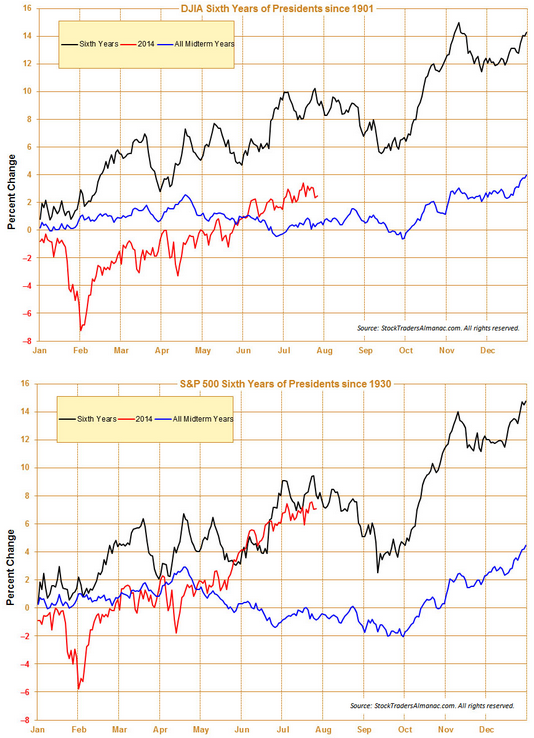 These charts show the historical market performance for both the Dow and S&P during the sixth year of a presidents term. History shows the August to October period as a seasonally weak one. Ryan Detrick provided some detailed return calculations for the S&P 500 Index that encompassed various time periods. One of the several tables he included in his recent article, Here Comes August, Get Ready, is noted below. This data also confirms the fact the market has a tendency to be weak in August. 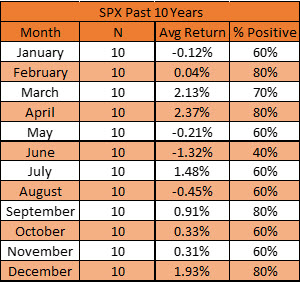 This is not a certainty though, as the tables show July is generally positive and this was not the case this year. "Through July 30, 61% of the S&P 500 companies have reported earnings for Q2 2014. 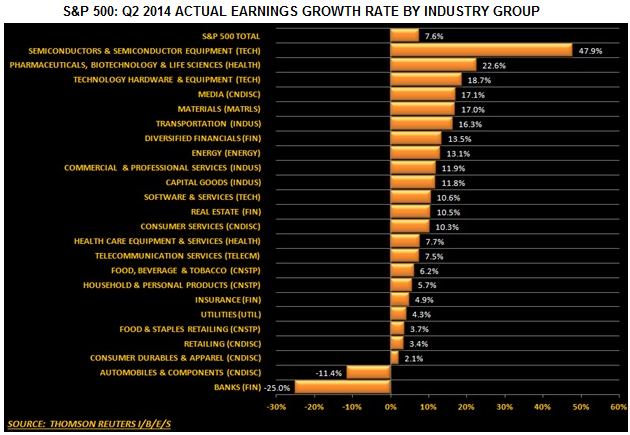 In aggregate the actual earnings growth rate for those 305 companies that have reported earnings is 7.6%. Excluding Citigroup (C), the actual earnings growth rate is 10.2% and the Financials sector actual earnings growth estimate is -0.5%." "The Q2 2014 blended revenue growth rate for the S&P 500 is 3.8%, which is above the 2.3% trailing four quarter average earnings growth. In aggregate the actual revenue growth rate for the S&P 500 companies have reported revenue for Q2 2014 is 5.2%." What was a bit odd about today's ending results for the market was the fact nearly every investment category was negative. Even the safety trade of U.S. treasuries lost ground as the yield rose to 2.56%. Yes, there are some worrisome issues facing the market: the Argentina default, a banking issue in Portugal, the Ukraine/Russia conflict, the Middle East conflict, etc. Investors should keep in mind the short impact crisis events tend to have on the equity markets. We discussed this again in a June post, Crisis Impact On Markets. The market is entering a seasonally weak period for sure; however, company and economic fundamentals remain intact in our view. We do not believe the economy is sustainably growing at 4% as noted in the first read on GDP earlier this week nor do we believe it is contracting. The earlier chart in this post that graphed the returns in the sixth year of a president's term, on average, had the market down about 6% during the July-October period. After today, the S&P is down about 3% from its high. Could the market decline another 3-7% to give us the much awaited 10% correction? Certainly. Market bottoms are hard to time though. As a final technical note, Charles Kirk also commented on the potential for a positive trading day on the first day of August. "there is a very strong tendency to see a bullish first of the month jumper trade when the last day of the month is this negative. In addition, the market has also tended to trade higher on jobs report days (19 of last 24)..."
The night is long, but Thursday night futures are indicating a positive bias to Friday trading at this point.